Like most of you, we started off in 2016 with some fresh goals. One of which was learning to make recipe videos and doing it regularly. It’s something I knew very little nothing about, but – as it turns out, Clark had some experience up his sleeve. If we’re friends on Snapchat, you probably already know this info. (You get a gold star for the day! ⭐️) But for those of you who don’t know, we filmed a video for this recipe last Friday. I was hoping to do some cute footage with veggies dancing around and looking festive. Only… I had no clue how to do these fancy things. I explain my vision to Clark and he says “Oh yeah! I want to show the ingredients in stop-motion before we start cooking.” Ok. Cool. That’s exactly what I meant. And then he informs me that he used to make home videos of legos and his dog, Chloe when he was younger. As it turns out, I married a prodigy. We’ve been together 12 years, we’ve been married almost 4 years, and I’ve just now learned that Clark was a filmmaker as a child. I was busy riding my mountain bike around the neighborhood, pretending the damn thing was a horse – meanwhile, Clark was practicing to become the next Steven Spielberg. Ancient history aside, I’m SO excited about this new recipe video! 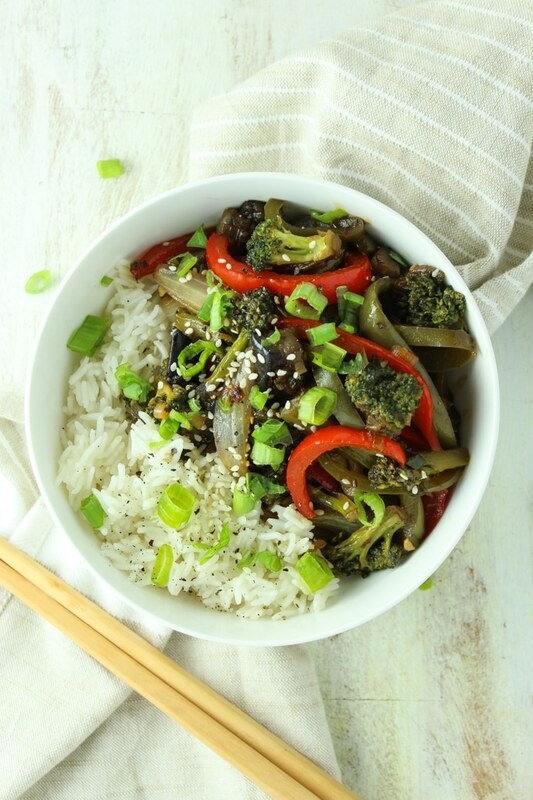 Our goal was to show you how we make stir fry at home using wholesome ingredients and a super simple process. The vegetables can be swapped out for whatever’s in your fridge and the meal is ready in less than 30 minutes. Our local Kroger King Soopers had an overflowing shelf of eggplant last week, so we decided to use it as the main ingredient in this dish. Also, I love eggplant. 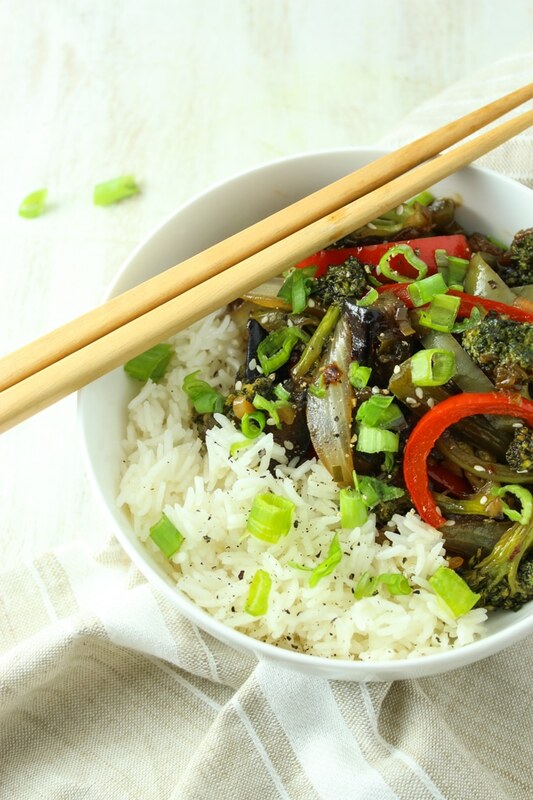 The other players are pretty standard: crunchy bell peppers, big slices of onion, and juicy broccoli. 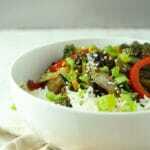 We served it over white rice because we were short on time, but I think brown rice would’ve made an even better combo. For an extra boost of protein, you could definitely add some tofu to the mix. 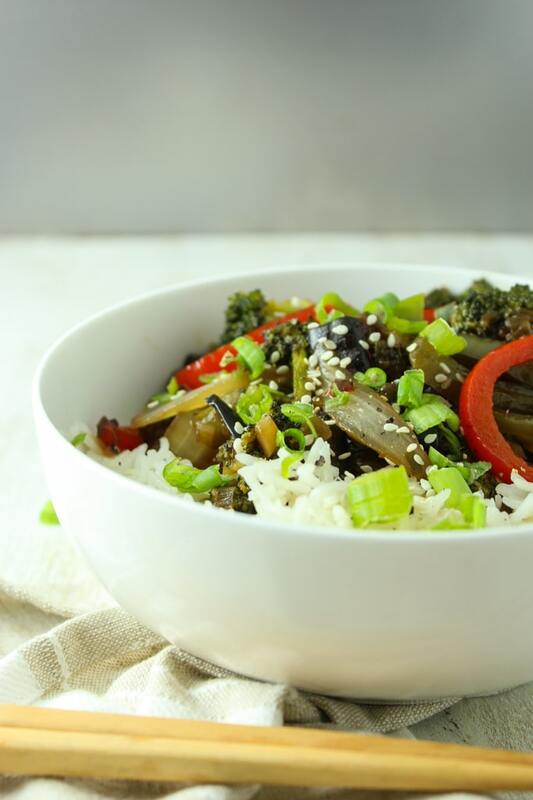 This vegan, eggplant stir-fry is better than takeout and contains half the calories! In a small bowl, whisk together the ingredients for the sauce and set aside. Prepare vegetables as described above. Heat oil in a large skillet to medium. Add eggplant cubes and stir to coat with oil. Cook for 3 minutes, then decrease the heat to medium-low, carefully add 1/4 cup of water and cover the pan. Cook 5-7 minutes until eggplant starts to soften. Add garlic, onions, bell peppers, and broccoli. Stir to combine and then cover the skillet. After 5 minutes, remove the lid and add the sauce. Stir until all of the veggies are coated. Increase the heat to medium high and continue cooking until the sauce thickens and the veggies are cooked to your desired tenderness – about 5 to 7 minutes. I recommend serving it over rice, but that’s up to you! The sauce is sooooo salty. I think the amount of Tamari is not correct. If the sauce is too salty for your liking, you could decrease it by half and substitute water! Sorry you didn’t like it.